Price: £4.55 (incl VAT) Sorry, this product is no longer available. 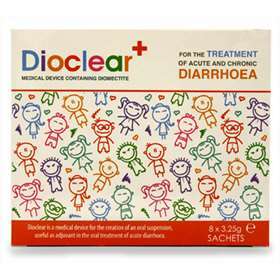 Dioclear is a unique effective treatment for diarrhoea that works directly on the cause of the problem fast. It contains diosmectite, a natural silicate recommended by healthcare professionals around the world. Dioclear has a unique triple action to help reduce the duration of the disorder fast and speed up recovery time. It naturally absorbs diarrhoea causing substances such as toxins, bacteria and virus (ex:rotavirus), preventing their adherence to the intestinal membranes. As it can absorb eight times its own weight in water, it reduces liquids present in the intestinal lumen, increasing stool consistency and slowing expulsion. Trusted worldwide to treat diarrhoea including acute and chronic. Suitable for all the family over the age of one year. Stops diarrhoea in its tracks. Can be used by pregnant and breast-feeding women. Adults: 1 sachet in 100ml of liquid 3 times per day. Children:> 6 years 2-3 sachets per day. Babies:> 1 year 1-2 sachet per day. Dissolve the content of each sachet in a glass of water or other liquid. For babies, the contents of the sachet can be suspended in the bottle feeder in 50ml of water or mixed with any other beverage, and divided into 2-3 doses throughout the day. It is also possible to dissolve the Dioclear in semisolid feedings. To obtain a homogeneous suspension, pour powder slowly in the liquid and mix well. It is advisable to consume Dioclear between meals. Product code: 3973336 Price: £4.55 (incl VAT) Sorry, this product is no longer available.